This post contains affiliate links. Hot Eats and Cool Reads may make a small commission from purchases through these links at no cost to you. Thanks for your support! These tasty muffins with little bites of chocolate chips are perfect for breakfast, the lunchbox, picnics or snack! They always say that breakfast is the most important meal of the day. Yet, I always choose to skip breakfast and just drink my coffee instead. My resolution for the new year is to eat out less, and make more breakfasts, lunches and dinners at home. I've been doing great so far and have saved a ton of money in less than two weeks! Today's recipe is my solution to having different options for breakfast at home, and also using what ingredients I already have on hand. Ripe bananas have been sitting on the counter for a few days just begging to made into something delicious! My love for baking muffins started in 8th grade Home Ec class. We were given a basic muffin recipe and a whole list of add-ins to make it our own. I took the recipe home after sampling and loving them at school, and begin to make them after school and on the weekends. Who knows if that useful class, that taught me some crucial life skills, sparked my love for cooking? These Banana Mini Chocolate Chip Muffins are a perfect way to start the day. Not only are they good for breakfast, but they're also great for lunch boxes, picnics or a snack at home. 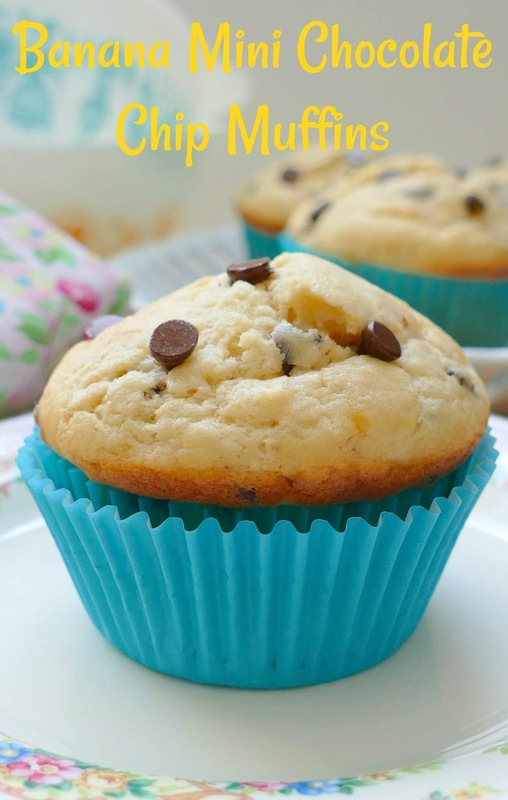 There's a hint of banana flavor and a taste of mini chocolate chips in every bite! I love to cut my muffins in half, and slather some softened butter on each half. So perfect with a mug of coffee or glass of milk too! 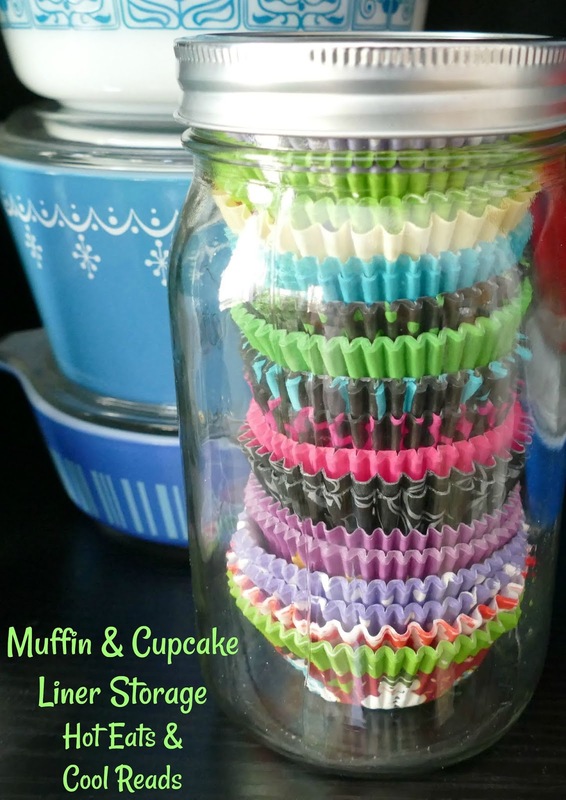 Do you make a lot of muffins or cupcakes and have tons of different paper liners laying around? Use a large wide mouth mason jar to store them! They stack and fit so nicely and stay clean when you store them this way. Stash away in the cupboard, or use them as a decoration on your countertop! 2. In a medium bowl, combine flour, baking powder, sugar, and salt. 3. Add eggs, milk, butter and vanilla. 4. Stir until combined and smooth, about 20-30 strokes. 5. Then stir in the mashed banana and chocolate chips. 6. Spoon batter into muffin cups. Bake for 20 minutes. I love Muffins, these look really good! These sound great and would be a nice treat for my kids! Thanks for sharing at Share Your Stuff Tuesdays! I'm a muffin fan too! These look delicious. Thanks for linking to the In and Out of the Kitchen Link Party. Hope to see you next week. I love muffins, and this one looks so tasty. I found you from Freedom Fridays and I'm so glad I did. I hope you'll come link up to my banana themed link party going on now at Future Expat so my readers can check it out too. Thanks so much for stopping by, Karen! I will stop by soon! We are on a muffins kick lately! Thanks for linking up to Freedom Fridays :) Pinned and shared on FB! My children love these muffins and they are so easy to make. I add a crumb topping using brown sugar, flour, and butter and it makes them look they are from a bakery. YUM!! I'm gonna let my nanners get brown just so I can make these for my girls!